D.B. 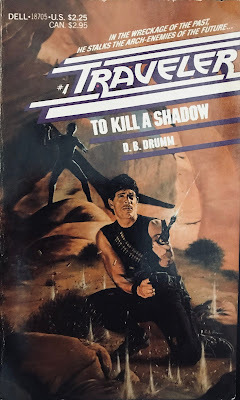 Drumm (author John Shirley) continues his trek with 'Traveler' entry “To Kill a Shadow” (1984 Dell), the fourth volume of the 80s post-apocalyptic series. The book picks up in the early part of 2005 and finds our hero in California hunting his arch enemies The Black Rider and Major Vallone. Other genre series' will stick to more realistic plot schemes like forging for food and supplies, exploring the barren landscape or just fighting warring bandits. Shirley certainly injects those elements into this series, but has a lot of fun creating horrific mutants and monsters and placing them into the battle sequences to propel the action. 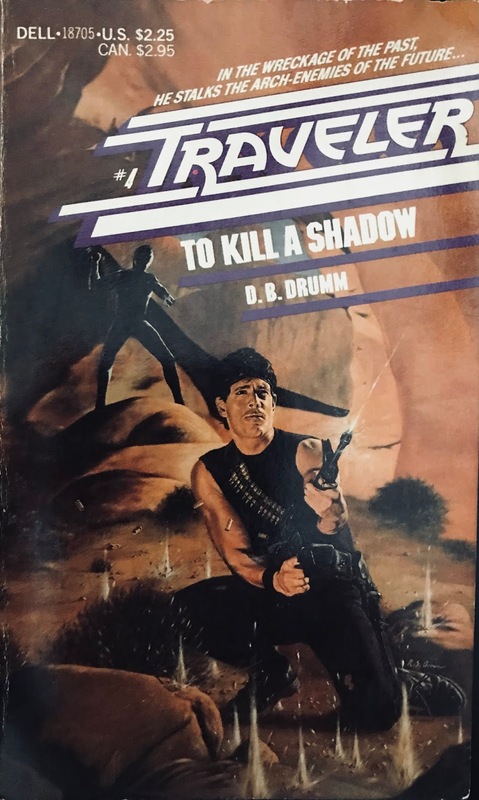 “To Kill a Shadow” prominently displays all of the genetic freakshows and monstrosities we've come to love about Shirley's vivid “splatterpunk” style. Just nine pages into our narrative Traveler and his “meat wagon” (fortified van) go into battle against giant Cen-Cars. What is that? Well, think of the Greek mythos of Centaurs, those men with human torsos atop a horse body. Now, do the same thing but substitute a car in place of the horse. These Cen-Cars are running rampant all over California devouring humans and animals and utilizing them as fuel sources to propel their car bodies. Wow! In an exhilarating car chase Traveler battles the Cen-Cars and frees human capital from an abandoned diner. The freed prisoners accompany Traveler back to a religious compound ran by a faux Messiah named Brother John. The middle of the story is typically a slow-burn with building characters and relationships, but Shirley keeps the pedal down and rolls right into more action. The fire fights increase between Brother John's followers/Traveler and the dastardly Glory Boys/The Black Rider (Major Vallone's soldiers). It's Shirley's show, which means that giant snakes with human heads are incorporated into the battle along with more Cen-Cars and an elephant-sized kitty cat. There's plenty of mind control, ESP, telekinesis and spiritual jargon mixed into the story...but again there's giant snakes, human cars and enormous cats to devour all of that nonsense. The author even attempts to humanize the typically immortal Traveler hero, this time keeping him blind for a large portion of the book. Additionally, Traveler takes on a needy child protegee and shows off some emotional depth. The Vallone/Black Rider mythos may have ended with this installment. It's absorbed most of the first four books and I'm anxious to see if the series will focus on a new direction starting with book five. There's mention of Traveler heading back to Arizona to bed down with his Native American beauty Jan. Wherever Traveler and Shirley go...I'm sure there is some nightmarish ordeal for the reader to enjoy. Fun stories, enjoyable series, talented author – this is why we love the genre.